I have few challenges on my apartment as my balcony does not have neither water nor electricity access at the moment, so whatever I needed to build, was going to be battery/solar powered and possibly reusing the same water for a while. Just to add one more to the mix, my balcony has only a couple of hours of direct sun light a day. 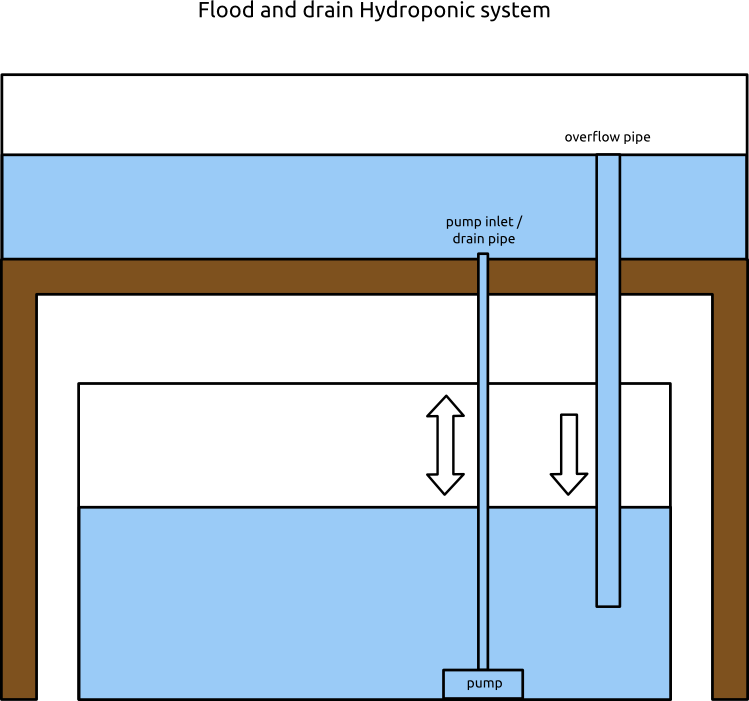 After some googling and some youtubeing I’ve decided I wanted to start with something not so simple after all: a multi-level flood and drain hydroponic (aka ebb and flow hydroponic system) and then eventually evolve that to an aquaponic ecosystem. For whoever is not familiar with the system, the flood and drain usually has one water tank, and one grow bed just on top of the water tank. The water is pushed with a pump and a timer on the grow bed containing the grow media that lets plants grow. There is an overflow pipe for when the grow bed is full of water, and once the timer stops, it starts emptying using the same pipe of the water pump. A picture is worth a thousand words, so I prepared a schema for you. I had some thinking to do and I planned to build an Arduino (or compatible) micro controller driven system, powered by a battery that gets recharged using solar panels. The idea is to build a multi levels system with plastic boxes as grow beds filled with clay pebbles as grow media. At the bottom of everything there will be a water tank and a pump that pushes the water on the very top grow bed. Every grow bed will have an overflow pipe for when it is too full of water, and will also have a small drainage pipe system to allow it to empty slowly and constantly. Every grow bed will make the water flow on the next one just below it, until the water gets back on the bottom water tank. The water pump is controlled by an Arduino, that gets energy from a battery, recharged by a solar panel. Pretty simple, right? Now there are many things to think about. I knew close to nothing about Arduino, and I have some knowledge about electronics, but not so much to allow me to build easily a project of this kind. I also knew nothing about solar panels in the “practice” space, recharging batteries, optimising electronics for small power consumption and so on. On the next post I will write more about the thought process, buying the right material and what I will end up building.